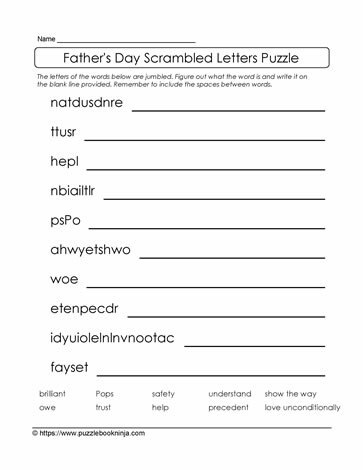 Unscramble the letters puzzle for Father's Day is a great way to connect fathers and kids as they work together to unjumble the letters. Kids learn new theme based words and dads learn how they make a difference in their kids' lives. To solve the puzzle, first review the list of words in the word bank. Next, return to the list of jumbled letters and use a variety of strategies to unscramble the words. Suits students in elementary grades 3,4,5 classrooms and home schools. Can also be used to support tutored students.